With no police support able to arrive from Reykjavik until the snowstorm clears, Andri and his colleagues need to work fast. It seems a hopeless situation, but with a suspect in custody awaiting questioning and a body awaiting forensic tests, Andri is desperate for them to prove themselves and make a breakthrough in the case. I thought that since this is on Amazon Prime, and there is a season two somewhat imminent, it might be nice to continue on the discussion of this show! 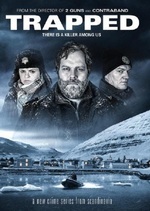 Already tense with the first episode, Trapped's second episode ups the stakes - opening with a lumbering chase in knee-high snow between Andri and his Lithuanian suspect. Deputy Asgeir comes through with a tackle and the suspect is taken to the tiny Siglufjörður jail, where he proves to be a most charming guest. Meanwhile back at the ferry, former police chief (now mayor) Hrafn is as eager to help the investigation as the ferry captain is reluctant to cooperate. Town officials and a visiting member of Parliament are busily working to schmooze the press and pressure the cops to clean up the case in a hurry for a surprising reason, exiled Hjörtur finds it complicated to fit back into his hometown full of so many bad memories and sharp whispers, and many conflicts abound for all the citizens of Siglufjörður, both personal and professional.